Doctors are in high demand almost anywhere they go. Unfortunately, most of what they are asked to do involves patching up the wounds of the worst kind of beings. Even still, most Doctors consider trading their healing talents for a chance to see more of the galaxy worthwhile. 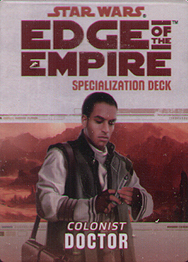 This deck requires the Edge of the Empire Core Rulebook and includes cards for all 20 talents available in the Doctor specialization.